This is your go-to page to keep updated on the most recent weekly Denlow events and information. PLEASE continue to read the emails that come from our Principal and from your Class Reps. Hot lunches are provided by Kids Lunch. Sign up at www.kidslunch.ca with Denlow password info here. Because our order numbers are quite low, Kids Lunch will only be available on FRIDAYS. Pizza Monday’s + Subway Wednesdays- new orders for March-June (15 weeks) are being taken NOW until February 14 on School Cash Online. Check your online cart to purchase. NO late orders will be permitted. No pro-rating of weeks, No refunds. Denlow SAC emails - Click on the Email Sign-up page to receive important SAC emails about school events, hot lunches, and more. Facebook Join the "Denlow Parents" Facebook page. For other school events, please see the school calendar on the Denlow school website (ie. separately run from SAC). If you are driving your kids in the morning, please park on nearby schools and walk OR use our “kiss and ride”. 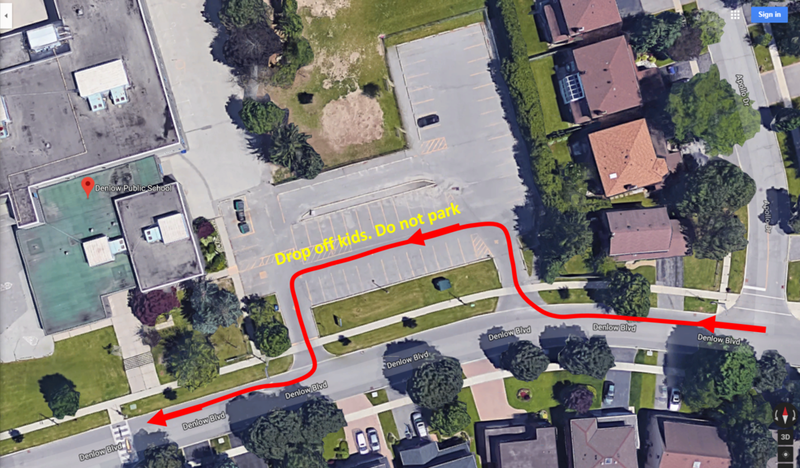 This the driving route in & out of the parking lot because it minimizes traffic which reduces unsafe driving habits. Watch the kids crossing at the light as there isn’t a cross-guard. Staff parking only at 8:15- 8:50am and from 3:15 - 3:45pm. Stay off cell phones while driving.